Michael Cimino was a fan of CAPTAIN LIGHTFOOT (1955). So it obviously inspired his later film. I am glad you referenced this since I didn't include that bit of trivia in the review. 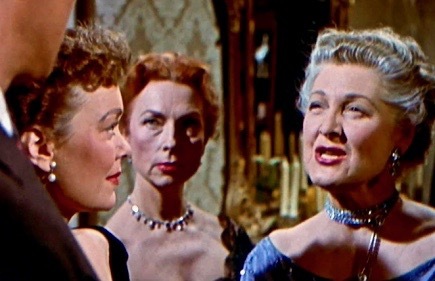 Sirk and Hudson were a winning combo. And I like them all, especially "Magnificent Obsession" and "All That Heaven Allows" and, of course, "Written On The Wind". The relationships in this film are so - tortured. I've seen them all (and love them all) except for NEVER SAY GOODBYE, which I've been curious to see. Holy effin hannah. I just discovered that Celia Johnson and Trevor Howard starred together in some kind of BBC adaptation of Paul Scott's "Staying On". Jesus H. Keerist. Something like what, five decades after 'Brief Encounter'? Did you guys know about this? What is "Staying On"? A big fan of this book is Anthony Burgess, first off. He includes it in his list of the best novels of the century. What else? Well, it only won the Booker Prize for its year. And also, it was merely an epilogue, a codicil, a #5 fifth book tacked on as an afterthought by novelist Paul Scott. Tacked on to what? Merely one of the best modern prose works of all time, 'The Raj Quartet". And now I learn that BBC adapted it and cast Johnson and Howard? My God. 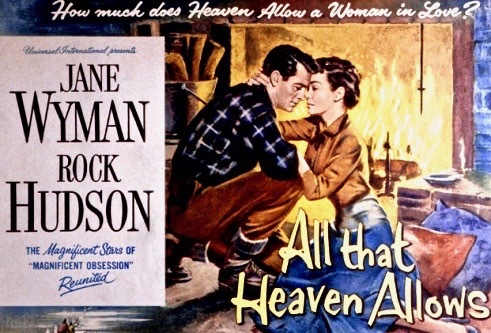 "All That Heaven Allows" - one of my absolute favorites. 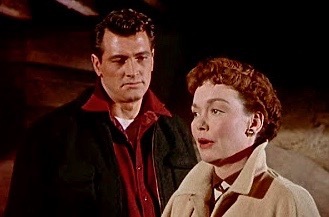 Never Say Goodbye isn't technically a Sirk film. For years I was curious about how close it was to the Sirk "brand", though Jerry Hopper was credited as director. Mark Griffin finally laid it all out in his Hudson bio. 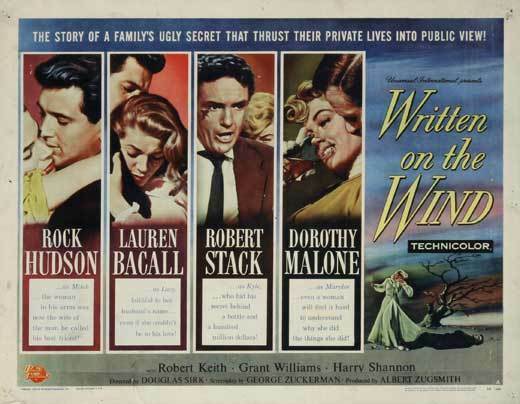 Sirk was initially attached in preliminary stages and was responsible for bringing German actress Cornell Borchers on board, but moved on to work on Written on the Wind. 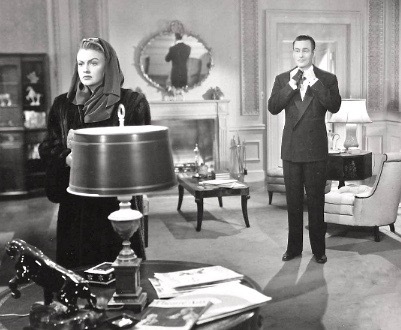 Later, Sirk checked back in with Never Say Goodbye and actually directed some reshoots of scenes with George Sanders. Griffin says it was one of the top films of the year, Rock being red hot career-wise. But it's definitely lacking that indefinable Sirk touch. Universal Vault had a beautiful widescreen print; before that I'd only had a pan-and-scan copy recorded onto disc from VHS of a showing on AMC. It's well worth seeing, but there's something "off" about it. The opening scene is of a blue and white station wagon driving down a suburban street and pulling into a suburban home, just like in All That Heaven Allows, (and also just like in Far From Heaven) but then the magic just doesn't happen. Thanks Dougie. Now I'm even more eager to see it. I wasn't aware the folks at Universal Vault released it. I'm surprised an old VHS copy of it from AMC isn't on YouTube. It's probably one of George Sanders' least known films from the 1950s. Warners had used the title in 1946 for an Errol Flynn-Eleanor Parker rom-com. I like George Sanders in just about everything I've seen him in but, through no fault of his, he's part of a problematic plotline which isn't particularly credible. He plays an itinerant sketch artist who has thrown in his lot with Hudson's wife (presumed dead) for an club act in which she plays piano and sings while he circulates through the crowd doing caricatures of the patrons. In what club we've ever heard of? It's an extremely awkward way to bring her back into the story after she's been presumed missing and/or dead for years. Sometimes when you develop a special fondness for a film, you stay away from it. You're afraid that if you go back to it, it won't hold up or be exactly as you remembered. In this case, the opposite occurred. I found even more meaning, when I sat down to rewatch ALL THAT HEAVEN ALLOWS. The two main characters drew me in to the story. 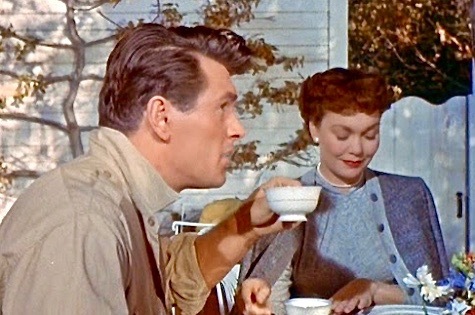 The relationship between Ron Kirby (Rock Hudson) and Cary Scott (Jane Wyman) starts innocently enough over a cup of coffee. Ron's taken over his late father's yard maintenance business and he's at the Scott home one fall afternoon pruning branches. When Cary's girlfriend Sara (Agnes Moorehead) is unable to stay for lunch, Cary invites the handsome gardener to join her, so the food won't go to waste. They strike up a conversation about the trees in her yard, and an instant bond forms. Their subsequent romance will become a scandal in Cary's community. The film seems to be written and played for other Carys in the audience. 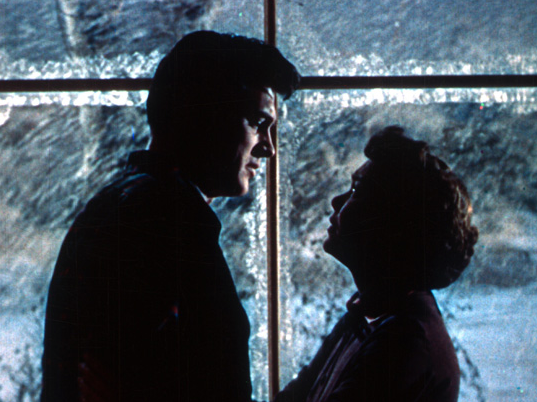 Sirk's storytelling is so smooth that you get caught up in it. And what people tell Cary in the movie, and what she even tells herself, seem like things a viewer can appreciate. The more philosophical speeches do not come across as preachy or unrealistic in any way. 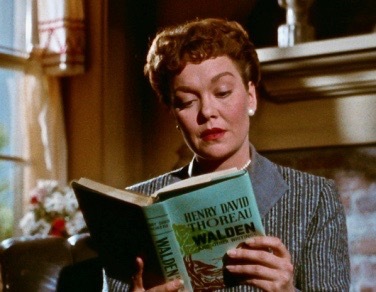 Even Sirk's use of Thoreau is expertly weaved into the proceedings, telling us there's a natural order in life. Especially in ways of the heart. Cary is struggling to let go of the past, and she is also struggling to simplify her life. For years, she's tried to please others and has been restricted by what everyone expects. Her friend Sara witnesses the awakening of her spirit. And while Sara will remain firmly entrenched in suburbia, bound by its inhibiting code of conduct, she supports Cary's need to break away from it. Other members of the community are not as supportive, which we see at a cocktail party in Sara's home. Cary has decided to introduce Ron to everyone, but many guests are unfriendly. One old gal is downright cruel. 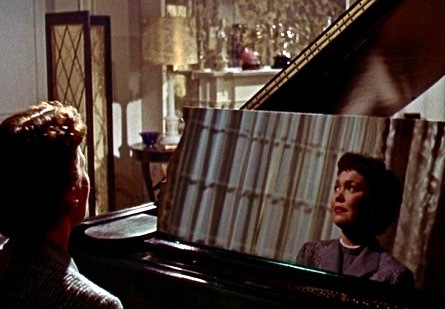 Sirk likes to use reflecting surfaces in his melodramas. And we see many of them in this film, often in the form of mirrors and windows. His careful use of mise-en-scene (staging and scene composition) allows us to glimpse the internal states of characters, as their facial expresses bounce off these reflecting surfaces. In some instances, there is an added use of shadow. 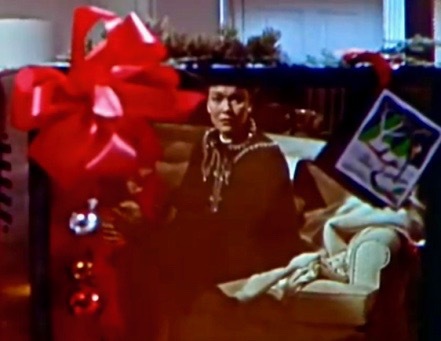 Or pieces of furniture and doors are used to conceal things or separate Cary from the people who are opposed to her. Cary's two college-aged children think she needs a television. It will keep her from being lonely, they reason; mainly, it will help distract her when she decides to break up with Ron. While Cary was getting to know Ron, she had no desire to sit at home and watch television. But after she calls things off with him, the kids give her a fancy new set at Christmas, and she is forced to contend with this symbol of her loneliness. 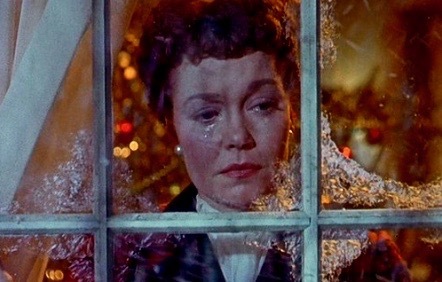 Again Sirk uses a reflecting surface, this time the TV screen, to display her emotions. 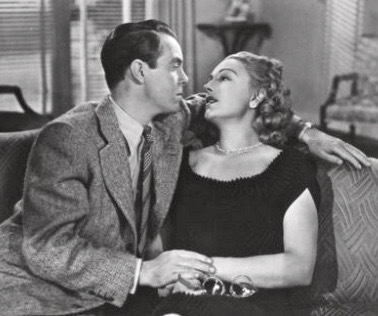 Of course, the film would not have a happy ending if Cary gave in and resigned herself to being a lonely widow. When she realizes her children are moving on with lives of their own that no longer directly involve her, she knows she deserves more. She has to battle her way out of a depression that has enveloped her. It's time to look towards the future and embrace it. At the same time, there are scenes which show Ron reflecting as well; and his own unexpressed desire to reconcile with her. A subplot in the film involves the refurbishing of an old mill that Ron is turning into a home. It's a place he intends to share with Cary, if she will let him. The living room in the renovated mill features a large window that looks out on to the pond and an area where deer roam during the cold winter months. 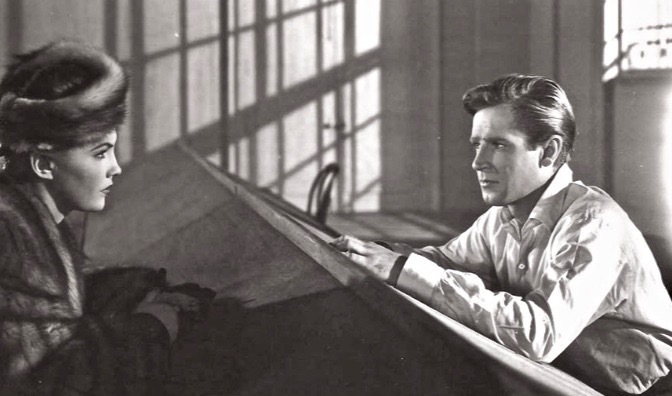 It's Walden personified, it's a world with natural order, and it's somewhere that Cary and Ron can both find happiness. At one point Ron is hunting and falls off the side of a snowy cliff. He's severely injured and nearly dies. The crisis rallies Cary to his side and precipitates their reunion. The children are no longer an issue. The disapproving community is no longer an issue. The only thing that matters is being together again. Heaven has allowed it, and it's quite extraordinary. 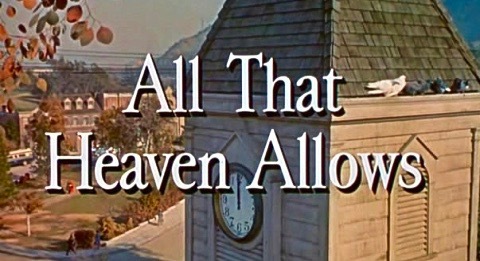 ALL THAT HEAVEN ALLOWS may currently be viewed on YouTube. Eagle-Lion. I will be looking at films from a favorite "small" studio. I think the messages of this movie are way overplayed, but it is certainly an engrossing visual presentation. I think the original story, which didn't include the references to Thoreau, suggested "heaven" was a perfect community, bound by its own rules, laws and order. Since Cary Scott's community (and children) would not accept her relationship with Ron Kirby, then heaven would not allow their union or ordain it. In some ways the story reads like code for an out gay relationship in close-minded mid-50s suburbia. I wonder if Cary was short for Cary Grant and Scott was short for Randolph Scott. Otherwise, they would have probably named the female protagonist Carrie not Cary. But whether or not it's about a gay couple, or a straight couple with a significant age difference, it's really a story about prejudice and overcoming that prejudice. Reversing the so-called social order. REPEAT PERFORMANCE is blessed with a good script and engaging performances. It is without a doubt one of the most intelligent motion picture of its era. 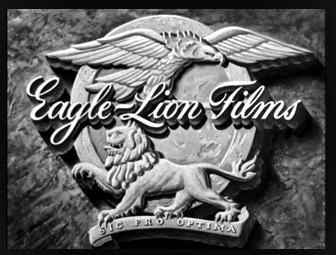 It typifies post-war output from Eagle-Lion, a fledgling studio that specialized in thought-provoking stories and employed some of the best British and Hollywood talent available. Joan Leslie is cast in the lead role, on a loan-out from her home studio Warner Brothers. She gives a stellar performance as Sheila Page, a Broadway star who's married to an alcoholic writer (played by Louis Hayward). To say their marriage is in trouble is putting it mildly. 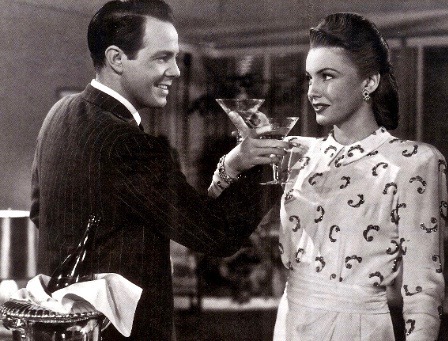 Joan Leslie's wholesomeness contrasts perfectly with Louis Hayward, whose character is a scoundrel. 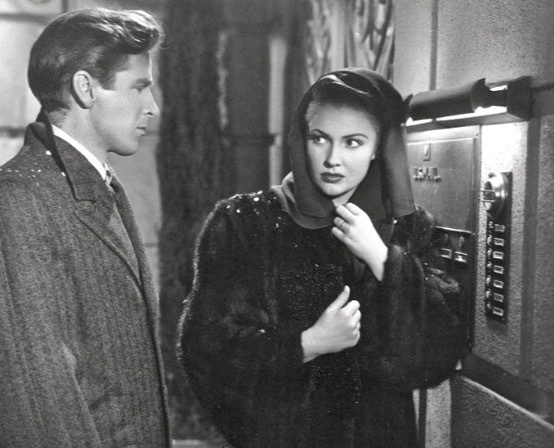 She also does nicely with scene stealer Richard Basehart who appears as a sweet but unhinged friend. The film uses a time loop. It starts with Sheila Page killing her husband Barney on New Year's Eve. As the clock strikes twelve, Sheila wanders on to the street in a daze. She wishes she could relive the past year and do things right. Magically, Sheila learns that her wish has been granted. Instead of it being the first day of 1947, she has now gone back to January 1st, 1946. The best part of this gimmick is that it invests even the most casual viewer in the plot outcome. Already, at just five minutes into the film, we are committed to watching the whole thing to see if her nightmare will happen all over again, or if she manages to have a different ending. As the previous year (re)plays, we learn how Sheila and Barney's marriage falls apart. We also observe Sheila's relationship with other people in their immediate orbit. There's a sensitive poet named William Williams (Basehart) that has always been supportive, though his year is just as bad as hers. Also, there is a wealthy benefactress (Natalie Schafer); a kind-hearted producer (Tom Conway); and a home wrecker (Virginia Field). All of these people experience their own dilemmas, which compounds the problems Sheila is facing. The film touches on how people behave in traumatic situations. Sheila wants to escape the pain she is experiencing in the present and escape to another "reality" that is safer. But can someone redirect their own fate? Is anyone ever truly in control of how things turn out? It's a self-reflexive sort of film. Joan Leslie is an actress, and she is playing Sheila Page an actress who plays an actress in a new stage play. It goes beyond actress playing actress; she's actress playing actress playing actress. Joan Leslie is entirely believable, and the rest of the cast are perfectly in-sync with the material and what's expected of them. Richard Basehart gives a strangely endearing performance. There's a brilliantly performed scene where Sheila visits William in a mental institution. He manages to convey insanity and supreme intelligence at the same time. At one point Sheila thinks he's smarter and certainly more sane than her. She says they should be on opposite sides of the table in the visiting room, suggesting she belongs in there, and he's more than capable of functioning on the outside. It's like she is speaking to a part of herself. The ending of the film returns us to the beginning. Barney does get shot again, and once again, he dies. But William, who's just escaped from the looney bin, turns out to be the culprit this time. As he's hauled away by the police, William tells Sheila that they couldn't stop fate, but they could change who's responsible. The movie seems to end on a happy note. But who's to say Sheila won't kill her next husband and need to relive another year of her life? There's no sequel, so we don't get a repeat performance of that. REPEAT PERFORMANCE may currently be viewed on YouTube. 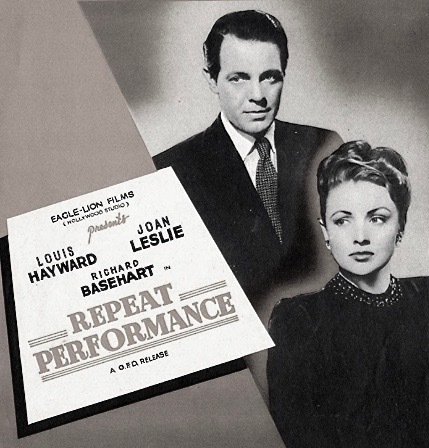 The "time loop" theme appears a couple of times in mass entertainment during this immediate post-war period. I can't recall which episode of The Mysterious Traveler... or was it a different radio show?... that had a character repeat a New Years day of last year and that one involved murder as well. I think the subconscious question running through these reflects the times: "could we have prevented all of the atrocities of recent years, Holocaust and the atom bomb included?" 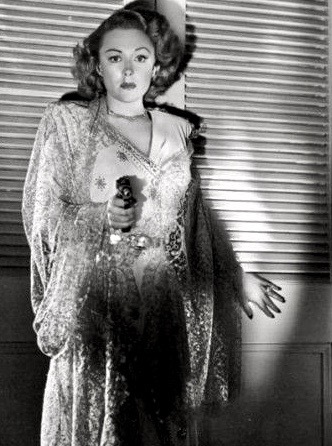 Yes, there's a certain degree of fatalism (and nihilism) in postwar noir. In this case, our protagonist cannot prevent a murder from reoccurring. But she is still able to retain her wholesome values. Yes, there's a certain degree of fatalism (and nihilism) in postwar noir. In this case, our protagonist cannot prevent a murder from reoccurring. But she is still able to retain her wholesomeness. OK... I must be thinking of a different show. However, The Mysterious Traveler does have a fascinating episode I heard before and had to double checked again. It is called "New Years Nightmare" and its story line is very, very different than this movie. 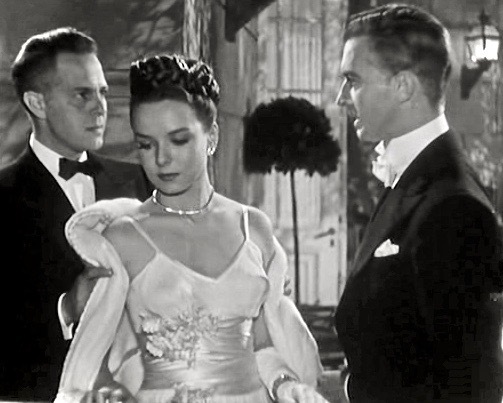 A man has a black-out on New Years 1947 while romancing one woman who isn't into him as much as he is into her and, after an amnesia oriented accident in the street, finds himself on New Years 1948 married to a different woman whom he isn't in love with. Things get worse when he bumps into the former woman and realizes he is still in love with her... and, yes, there is murder involved. I won't spoil it further. Now... you may not like it because it is an OLD time radio show with OLD melodramatic acting involved. However there are a few little items in it that will eerily remind you of some other stories of interest, even including a belt buckle involved as a key prop. The film is so dense - visually - that it can be watched endlessly. A case in point - all the children on the large sleigh celebrating Christmas - viewed in two ways - from the children's point of view and from Cary's - two very different experiences - celebratory and bereft. The deer in the picture window at the end - ripe for endless discussion - the deer doesn't run away like it did in an earlier scene - it seems to want to be a part of what is happening inside - the refurbished mill has achieved heaven for two troubled human beings. 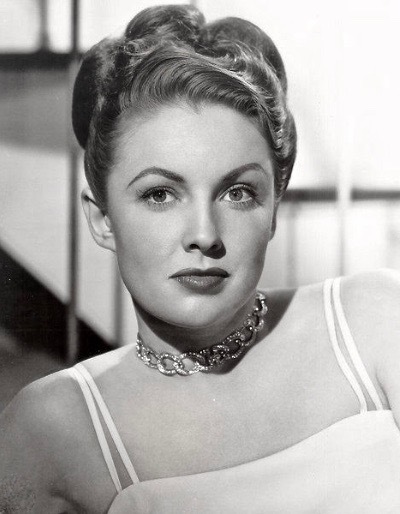 Joan Leslie is an actress, and she is playing Sheila Page an actress who plays an actress in a new stage play. It goes beyond actress playing actress; she's an actress playing actress ﻿playing actress. This kind of meta-theater is found in one of my favorite movies, Peter O'Toole and Steve Railsback in 'The Stunt Man' (the source novel was that from which two other films on the same concept also emerged --Truffaut's 'Day for Night' and I forget the other one). On Saturday my review for RUTHLESS (1948).